The “cure”—for cancer, HIV, Alzheimer’s—motivates countless charity walks, ribbons, and scientific careers. But what if a cure isn’t possible? No vaccine can alleviate an amputee patient. No pill can restore a leg. No salve can regrow an arm. Unfortunately, body pains such as “phantom limb” syndrome haunt soldiers returning from war and car accident victims with a pain that cannot be soothed yet doesn’t technically exist. Pain stems from communication between the body and brain via the spinal cord. Touching a hot stove triggers receptors that fire signals up to the brain, so although the pain is felt in the hand, it exists more in the brain than in the hand itself. Change a few connections and a hand on a hot stove can feel the same as a hand not on a hot stove. Phantom limb is somewhat different. The Mayo Clinic explains that phantom limb involves the same spinal nerves and part of the brain that would be activated if the limb and receptors involved were intact. Imagine it as a three-step system where steps two and three have learned to go on in the absence of step one. This is different than the pain a patient feels in the remaining limb, which is likely to have its own aches. Phantom limb has no origin, which is harder to combat than other pains. How do you trick the mind into believing a limb exists? 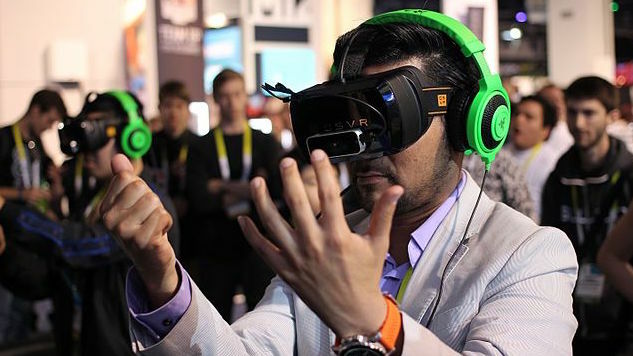 Some scientists believe virtual reality is the answer. In particular, researchers at the Chalmers University of Technology in Gothenburg, Sweden, may have a solution. In a recent paper, this team of scientists reported that patients suffering from phantom limb syndrome who underwent virtual reality treatments show improvements after 12 sessions. To improve phantom motor execution, patients were able to perform tasks with a virtual limb replacing their amputated limbs. The results of the trial are promising, not only for amputee patients who have hope of living without pain, but for numerous fronts of medical research. Much of the conversation surrounding treatment for phantom limb pain is focused on injured soldiers, and these patients potentially have even more to gain. Researchers at the University of Southern California have been investigating the use of VR to treat symptoms of post-traumatic stress disorder. The team believes that exposing patients to the stimuli that trigger their symptoms in a controlled setting could ultimately lessen or eliminate those symptoms. Conversations about anatomical gift programs can be precarious. Although donating one’s body to science is a noble act, it is not without a sense of sacrifice. Virtual reality could turn the tables, eliminating the need for human cadavers to train physicians. Scholars at the University of Warwick have emphasized the advantages of virtual reality, perhaps the most appealing being the unlimited number of attempts that students have to get it right. Actual cadavers are not as forgiving. Duncan Gilles of the Department of Computing at the Imperial College London agrees. His presentation about the use of virtual reality in medicine emphasizes the need to train physicians on difficult surgical procedures, which are best perfected with practice. Virtual reality offers more opportunity for that than traditional learning methods. Ultimately, virtual reality opens up possibilities beyond phantom limb syndrome. It makes sense — what cannot be done in reality can instead be accomplished in virtual reality. Kelly Coughlin is a medical student and freelance writer in Buffalo, New York.